Wash Mango ginger(available at any indian vegetable store) with water and peel the skin off. 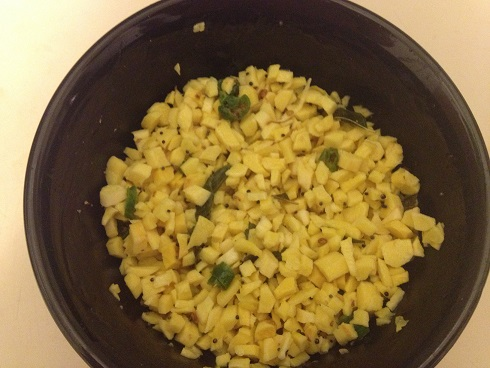 cut Mango ginger into small pieces.Add salt and lemon to it. Heat oil in a pan. Add asafoetida (hing) and mustard seeds to it.Once it starts popping add fenugreek (methi) seeds,curry leaves. chillies. Turn-off the stove. Add this seasoning into mango ginger.Mix it well. This will go well with rice/parathas. It is good for digestion and will also go well with Buttermilk (Chaas). Hi Neeta, mango ginger is ginger which has been grown near mango trees and thus inherits its flavour. It is available in most vegetable/grocery supermarkets in south India, but I am not sure if you would be able to get it in the US. You can try the Indian/Chinese supermarkets in the US, you may get lucky.